PuzzleMad: Rex and Ali Surprise Me...Again! Rex and Ali Surprise Me...Again! We are very lucky that we have a blog post today! Having spent a week on leave, visited the outlaws in Edinburgh and then a very nice trip into central Scotland for some relaxation, I have done very little puzzling for quite a while and certainly not solved anything for ages. I am starting to run out of things to blog about! 😢 I did take my Haleslock 5 with me and spent some hours on it but I am MUCH less bright than the other puzzlers who all seem to be managing to open theirs - I am getting absolutely nowhere! There are some interesting noises inside but I cannot make them do anything other than rattle. I'll keep trying but Einstein's "truth" remains true! I have known Rex Rossano Perez for quite a few years now. 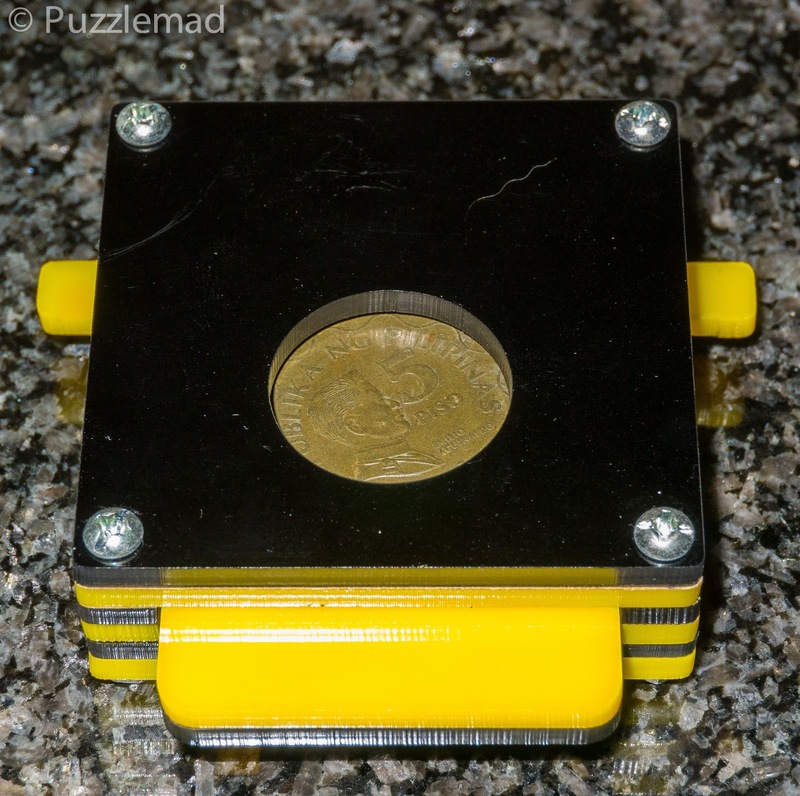 As a young lad in the Philipines, he began as a cuber and then moved on to making his own puzzle mods and was active on the Twisty Puzzle forum. 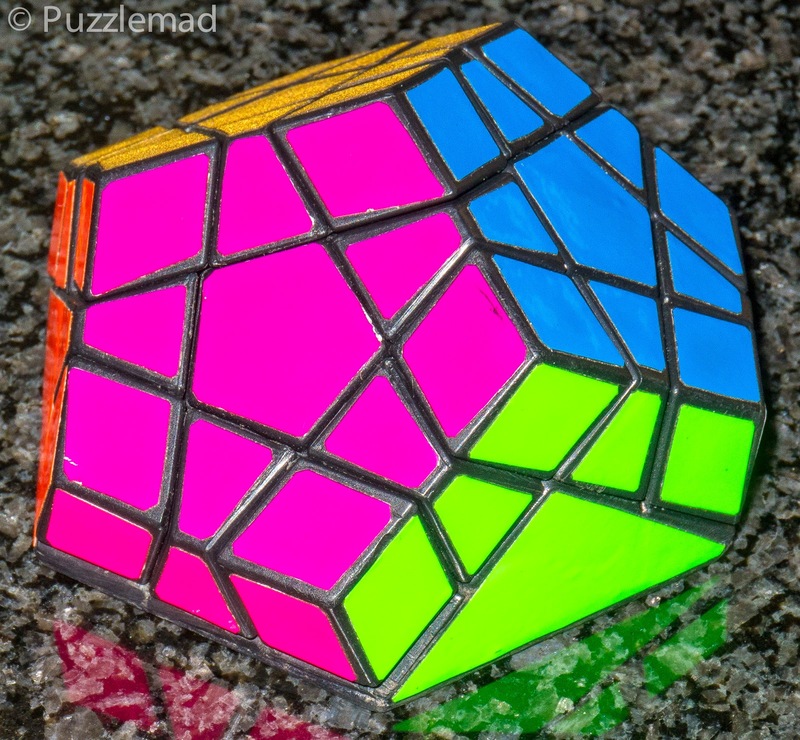 When he showed off the Halfminx, his modification of the Megaminx, back in 2013, I contacted him hoping to buy one and because of his young age, he had no access to PayPal and a rather elaborate sequence occurred where I purchased some puzzles from MrPuzzle and had them shipped to him as payment. It worked well then and whilst financially the puzzles I bought him were valued higher than the cost of the Halfminx, I actually felt I got a better deal. 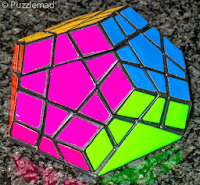 That Halfminx was great quality and kept me busy for a year before I finally managed to solve it. Over the intervening years, I saw Rex complete his school education and then go on to train and, I'm pleased to say, recently qualify as a radiographer - he has occasionally shown off an X-ray of a puzzle (although none as useful as my X-rays of the Lotus and other Strijbos puzzles). Over the last year, he seems to have had access to a laser cutter and has been showing off on Facebook some of his new designs. I seldom buy plastic puzzles (you all know that I have a fetish for wood) but at the last MPP Ali showed off a few of Rex's latest puzzles. Out of curiosity, I had a little play and was very pleasantly surprised! These puzzles are terrific - the look, the feel and the puzzling pleasure is really REALLY high. One of the designs that I played with was the Aguinaldo pictured at the top. During my idle exploration at the MPP, I was just fiddling having decided that I was going to buy a few. I had no intention of spoiling my own puzzle pleasure by fully solving at the MPP. Ali and I were chatting when, totally out of the blue, a little piece dropped out of the puzzle. I had no idea where it had come from and did not know whether I had broken Ali's toy. I certainly had not released the coin (obviously that is the aim) - Ali and I exchanged glances...he had never seen that piece before either! After a little more exploration, I worked out how to put it back and worked the puzzle back to the start position. After that, I did little more other than to admire the others. It transpired that after the MPP, Ali contacted Rex to discuss the solution to the puzzle and both of them were surprised at each other! Rex asked Ali whether he had found the little white piece and was surprised back when Ali reported that he had solved the puzzle without finding it but that I had managed it. In the meantime, I had been contacted by Rex to say that another batch of puzzles was going to go up on Paradise and did I want to buy a copy before he put them up for sale and they sold out? I must have hesitated for a nanosecond and then bit his mouse off! Yes yes yes! Of course I would buy them! I asked about Aguinaldo but Rex said that they were not being made due to difficulty getting the coin. I didn't think about it again but was very surprised when a copy of Aguinaldo was in the package I purchased. It would appear that Ali and Rex conspired to send me a gift. Thank you guys - I REALLY do appreciate it! After opening the package of puzzles when they arrived yesterday, I could not resist starting straight on with the Aguinaldo. This one is a blind maze puzzle with a clever but simple mechanism to navigate the pathway. I don't recall the maze on Ali's being so long but I gradually worked my way to the end and the coin came close to coming out but just not quite enough room for it to drop. Then I explored a bit further and that extra piece dropped out on me - I still wasn't sure where it came from but suddenly I was able to go further and the coin fell out on the table. (I knew better than to do these in my customary position with a cat on my lap). Aguinaldo completely solved - not half solved like Ali did! The puzzle is not terribly hard but certainly is fun and clever. I returned everything to the beginning and did it again a few times (placing the extra piece was just a matter of placing it inside at the correct time but I had no idea what was going on inside. In the end, once I felt I knew the puzzle, I undid the nuts and bolts and took a couple of layers off and enjoyed a view of the maze. AHA! Now that really is clever! Ali had actually not fully solved his puzzle - he had managed the coin release at an earlier stage than intended and had not gone far enough to get the small white square - I am sure that he has enjoyed a second Aha! moment now that he knows there is more to do! This puzzle is rather like a worry bead just now - I keep playing with it. Thanks Ali and Rex, for the great puzzle, the fun at both MPP and afterwards getting such a nice surprise. I now don't actually know whether to believe that Aguinaldo will not be available again or whether it was a ruse to keep me away. Rex puts his designs up for sale periodically on Puzzle Paradise so keep an eye out in the future or contact him via Facebook. I certainly will be looking for more. I'll keep the other 2 for a future blog post as I seem to be running out of solved toys just now. Great review Kevin. Rex’s puzzles are a lot of fun. I thought I had solved Aguinaldo by removing the coin but I never found the small white piece. I’ll have to go back and do more exploring now! Keep at it. 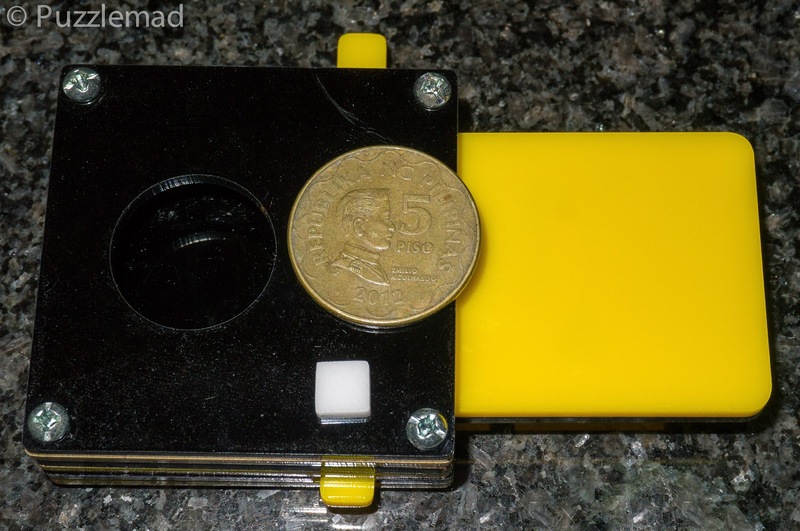 The coin should only come out when the slider is fully extended out. Allard Bites Off More Than I Can Chew!